The Obersalzberg sits 1200 feet above the alpine village of Berchtesgaden. During the Third Reich, this beautiful, pastoral community became known as Hitler's mountain headquarters. 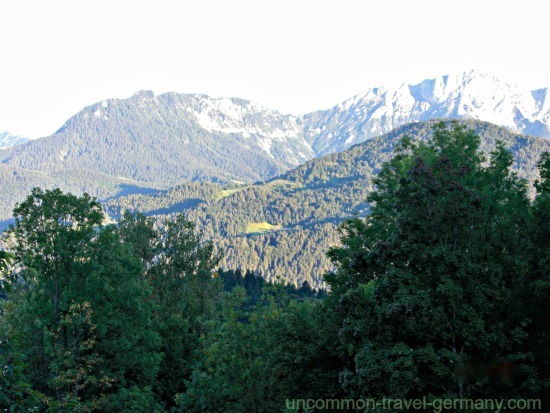 Prior to 1933, this area was the scene of rustic mountain farms and modest guesthouses where visitors would come to enjoy the breathtaking natural beauty of this little corner of the Bavarian Alps. This had been a well-known vacation spot for many years. Sigmund Freud, Johannes Brahms, Robert and Clara Schumann, Theodor Fontane, Caspar David Friedrich and Bavarian royalty all visited the Berchtesgaden area. According to German legend, Charlemagne is sleeping in a cave in the Untersberg mountain across the valley from the Obersalzberg; the story says he will return for the final battle between good and evil at the end of the world. During the 1930's and war years, this vacation spot became the country residences of many well-known figures of the Third Reich. Adolf Hitler first arrived on the Obersalzberg in 1923, staying with a friend after his release from prison, then returning to rent a farmhouse (Haus Wachenfeld) on the mountain in 1928. He finished writing Mein Kampf here. 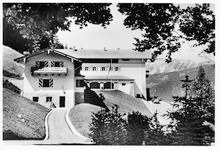 Hitler bought the farmhouse in 1933 and remodeled it into a large, alpine-style mansion he called the Berghof, or "mountain farm", which he visited frequently during his years as German Chancellor. Hermann Goering and Martin Bormann acquired homes on the Obersalzberg near Hitler's, and Heinrich Himmler and Albert Speer had homes in the area as well. 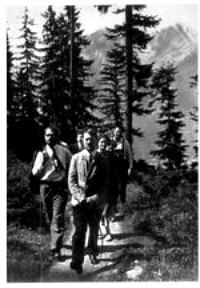 The property owners on the hill were either bought out or forced out and a massive building program was organized by Martin Bormann. 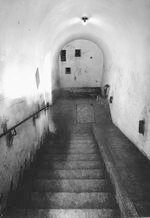 Administrative buildings, barracks and workers' housing covered the area and below ground the entire hill was honeycombed with a maze of tunnels and bunkers. David Lloyd George (former Prime Minister of the U.K.) had a meeting with Hitler at the Berghof in 1936, and Prime Minister Neville Chamberlain had discussions with Hitler at the Berghof in 1938. 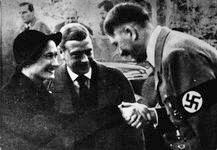 Other important guests were received there as well, including Benito Mussolini and the Duke and Duchess of Windsor. Eva Braun, Hitler's mistress, spent much of her time at the Berghof. Right next door to Hitler's Berghof stood the Hotel zum Türken, which began as an inn in 1630; the current building was begun in 1911 and was still operating as a hotel in 1933 when Hitler purchased the house right beside it. The hotel was confiscated in 1933 and used to house the security service (SD) guarding the Führer. Largely destroyed during the bombing, it was returned to the original owners after the war and is still serving visitors to the Obersalzberg. The bunker system under the Türken connects to Hitler's walled-off bunker; the tunnels under the hotel are open to the public. 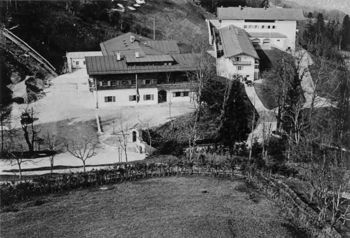 The photo at right shows Hitler standing at the end of the Berghof driveway with the Hotel zum Türken above. 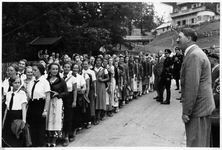 Many propaganda photos were taken showing Hitler as a man of the people, here greeting members of the League of German Maidens. Hitler's favorite place to relax was a small, round building was built in the woods just across the valley from the Berghof. It has been called the Tee Haus, not to be confused with the Eagle's Nest. 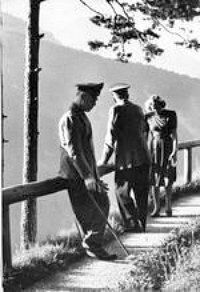 Hitler's daily routine was to walk to the tea house, read and visit with guests, then return to the Berghof. The building was destroyed after the war; nothing remains now, but the overlook that shows up in many period photos is still there on the pathway to the house. 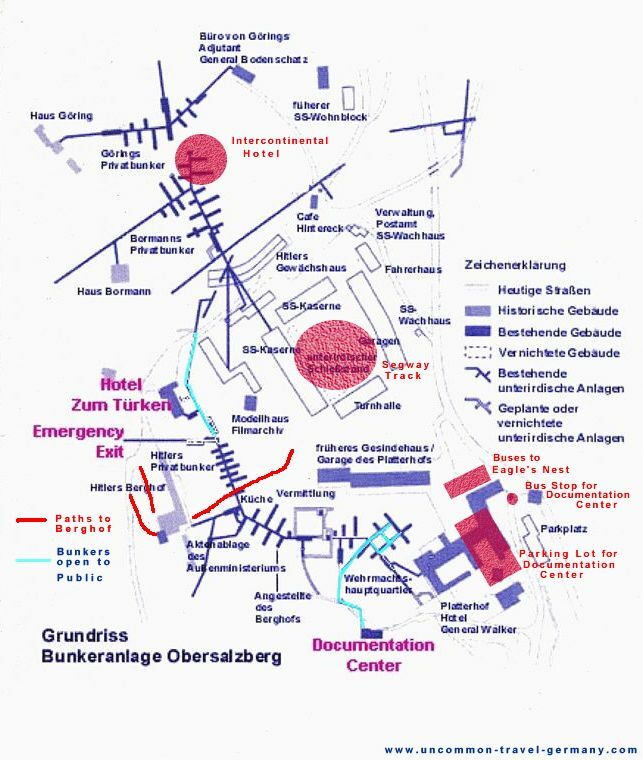 The massive bunker network under the Obersalzberg was actually built as a collection of interconnecting air raid shelters, not as a military defense system. The construction started in 1943 after Allied bombing was becoming a serious problem. See map of bunkers. Towards the end of the war, Propaganda Minister Joseph Goebbels tried to create the impression that the Nazis had an unshakeable grip on the alpine area that would make it impossible, or extremely costly in lives, to dislodge them. The purpose was to influence the Allies to agree to a negotiated end to the war; some in Berlin hoped to persuade the Americans to join them in their battle against the Russians. 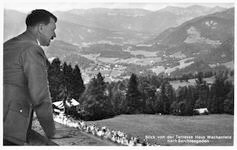 General Eisenhower believed that the Berchtesgaden area might be the scene of Hitler's last stand and this was one reason why the Western Allies fought their way across Bavaria to Berchtesgaden instead of hurrying on to Berlin. It turned out to be false; the Allies were met with almost no resistance and Hitler committed suicide in Berlin on April 30, 1945. 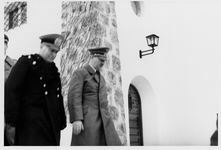 His last visit to the Berghof had been in July of 1944. On April 25, 1945, The RAF launched a massive bombing raid on the Obersalzberg. Most of the buildings were damaged or destroyed, including the houses belonging to Goering and Bormann, but the Berghof was only partly damaged and the mountain's bunker system survived intact. In the photo, the Türken is up the road and a little to the left of the Berghof. 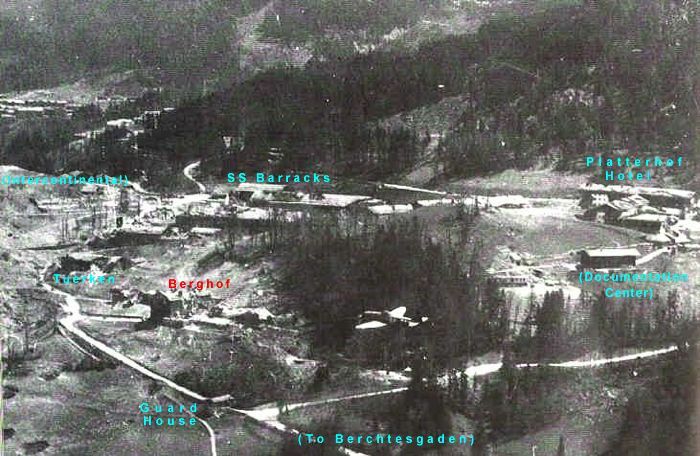 The "before and after" photos below show the Berghof and Hotel zum Türken on the lower right, with the SS barracks on the left. Above the barracks in the center is the Platterhof Hotel (now the parking lot for the Documentation Center). 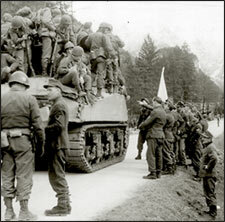 American soldiers of the Third Infantry Division were the first to arrive on the Obersalzberg on the morning of May 4, 1945, followed by French soldiers later that evening; the Americans arrived only four hours after the SS had set fire to the Berghof and left the area. Soldiers from Easy Company, 101st Airborne, came in the next day, contrary to the scenario in Band of Brothers. For more details about these events, see The Race for Berchtesgaden. On May 4, 1945, the local government representative surrendered the town of Berchtesgaden to the American officer in command, Lt. Col. Kenneth Wallace. There was no resistance in the town or on the Obersalzberg. The SS commander on the Obersalzberg had informed the mayor that there would be no resistance on the mountain. 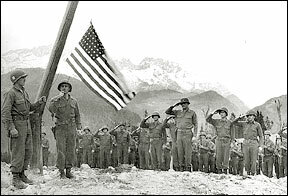 Berchtesgaden was in the sector of Germany assigned to the U.S. forces. After an initial period of lawlessness, in which the Moroccan troops from the French army were noted to be the worst offenders, things settled down. 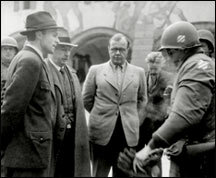 Parts of the Obersalzberg itself remained under control of the U.S. Army until the 1990's when the some of the buildings associated with the Third Reich were returned to the government of Bavaria. Hitler's Berghof was mostly intact until 1952 when the West German government destroyed it to deter pilgrimages by those sympathetic to the Third Reich. The houses belonging to Goering and Bormann were heavily damaged in the raid and were later razed, along with the ruins of the SS barracks above the Berghof. The Platterhof Hotel, on the hill above the Berghof, was damaged but later fixed up, renamed the General Walker Hotel, and used for many years as a low-cost vacation spot for American service members stationed in Germany. In 1999 the hotel was returned to the Bavarian government and it was torn down in 2000. The area is now a parking lot for the Documentation Center. 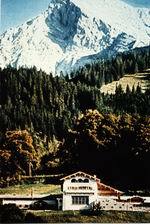 For more information on the Berghof, then and now, see Hitler's Berghof. To learn more about what the Obersalzberg looks like now, see Obersalzberg Today. For more details on the history and lots of fascinating historical photographs, see www.thirdreichruins.com.